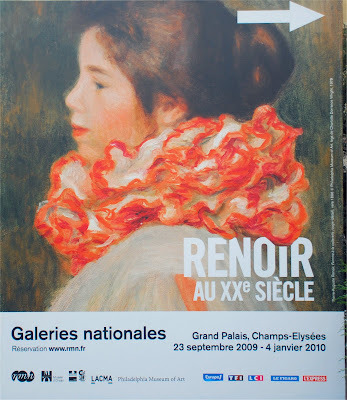 After visiting the special Renoir exhibit in the Grand Palais yesterday, Amanda and I walked down Avenue Montaigne again, this time during the day when all the high fashion shops were open. 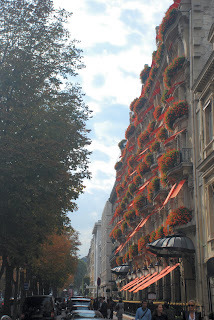 The Avenue also features several jewelry shops including Harry Winston (which was robbed last December of €80 million in jewels last December) as well as the beautiful luxury hotel Plaza Athénée. At the end of the street (closest to river) is the Théâtre des Champs-Élysées. 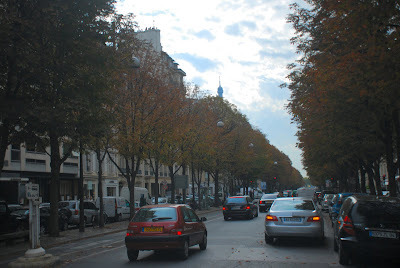 This is a view of the street from near Champs Elysees. You can see the top of the Eiffel Tower in the distance. 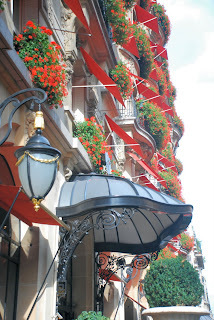 Plaza Athénée hotel with red geraniums covering the front. This is a wide-angle view from the end of the street, with the theatre on the right and the Eiffel Tower in the distance. Perhaps the most modest building on the street is the Bar des Théâtres across the street from the Théâtre des Champs-Élysées. As this reviewer accurately characterizes, it is "a good old-fashioned brasserie providing traditional cuisine: good quality, no-frills, and nothing out of the ordinary." Apparently it specializes in steak tartare. After our late night visit down Avenue Montaigne last week, I mentioned the movie to Amanda after reading about it on the internet. Valérie Lemercier was awarded a César Award for Best Actress in a Supporting Role for her performance. The film also received a shortlist nomination for an Academy Award for Best Foreign Film. It gets a 6.9 (out of 10) customer rating on IMDB. She rented it from the "Videosphere" at the end of our street and said much of the movie was actually filmed on location, which was one of the reasons we revisited it yesterday. Jessica, raised by her grandmother, comes to Paris and gets a job at a bar across from a performance complex where a play, a concert, and an art auction will occur the same evening. It's a world in flux: the play's star wants off a popular TV soap that's made her rich, and she covets the lead in a film about de Beauvoir and Sartre; the pianist hates the concert circuit, but his wife who's his manager may leave him if he quits; a self-made widower with a girlfriend less than half his age is selling his collection of modern art - his son, a professor, objects to his father's love life. The stage manager at the complex is resigning after 30 years. Jessica sets the tone for how it all plays out. 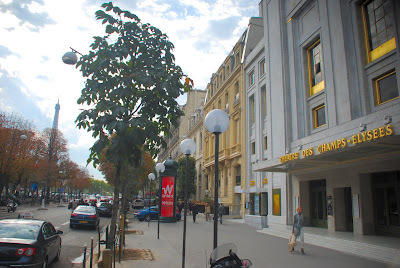 The "bar" is the Bar des Théâtres and the "performance complex" is the Théâtre des Champs-Élysées. We had lunch at the bar (my typical risk-free Poulet Roti - Roast Chicken) with a seat by the window on the sidewalk so as to watch the people (one of my favorite Paris activities). 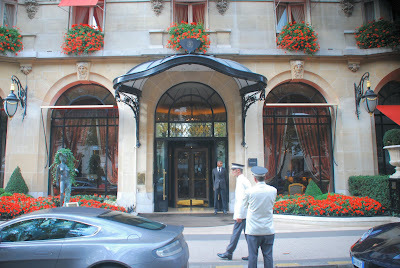 Here I am standing in front of the brasserie. 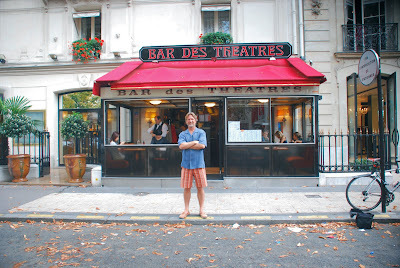 Knowing that we would be walking down the toniest street in all of Paris and that Amanda would want to visit some of the high-end fashion stores, I wore my favorite orange plaid shorts with blue Tommy Bahama silk shirt. While this is apparently quite fashionable in the States (I wouldn't know, I just wear what Amanda tells me to), in Paris where everyone wears blacks and solids (the subject for a future post! ), I knew I would look positively silly. Sure enough, Amanda refused to let me accompany her into any of the shops.